This tape is a wonderful crafting and sewing aid. It doesn’t leave any residue. It is easy to see through. It is slightly flexible. It is easy to write on too. A win, win, win, win, situation. I use it for marking pattern pieces for my students. I can tell a front piece from the back piece, but for new seamstresses once the pattern is removed that can be difficult. I use it on the machine to mark tricky seam allowances. Since it leaves no residue it can be used for top stitching. It will even hold together fabrics that can’t be pinned or basted prior to sewing, like leather and vinyl. 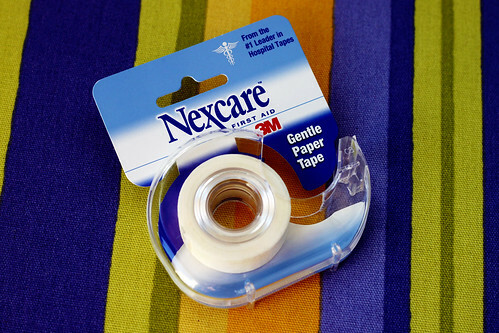 I love to use it to repair torn patterns too. I like it better than masking or painter’s tape. It is my ‘go to’ temporary holding tape. This entry was posted on Tuesday, October 13th, 2009 at 3:00 am and is filed under Craft and Sewing. Tagged: Craft, Sewing. You can feed this entry. You can leave a response, or trackback from your own site. Thanks for the tip! I’ll try it. What a great tool! You know *so* much about sewing! Thank you for sharing it with your readers!